The Strike of 1877, also known as 'The Great Strike' took place on railroads across the nation. The strike was the result of continued wage cuts of the laborers such as engineers and trainmen, while many of the companies continued to pay out dividends to its stockholders. 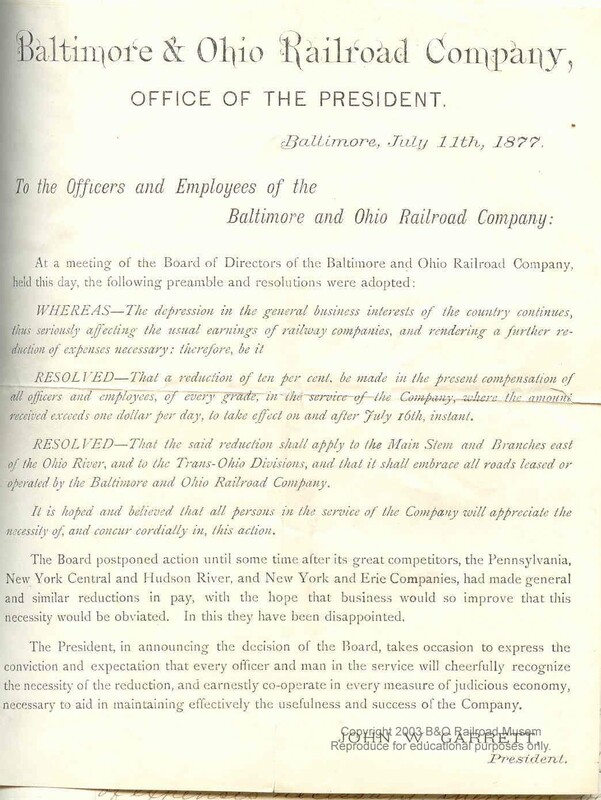 The B&O Railroad, based in Baltimore, Maryland, was one of the last to cut the wages of its employees. 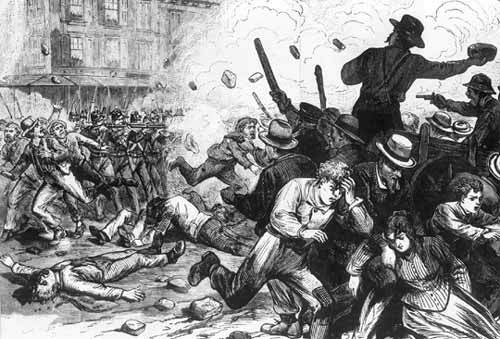 When the wage cut was announced on July 11, 1877, the workers had had enough. The strike started in Baltimore and spread across the entire nation. Standard 3B: The student understands the rise of national labor unions and the role of state and federal governments in labor conflicts. TITLE: Announcement of Wage Cuts on the B&O Railroad. NOTES: The Strike of 1877 was touch off by a series of wage cuts on nearly every Railroad in the Nation. 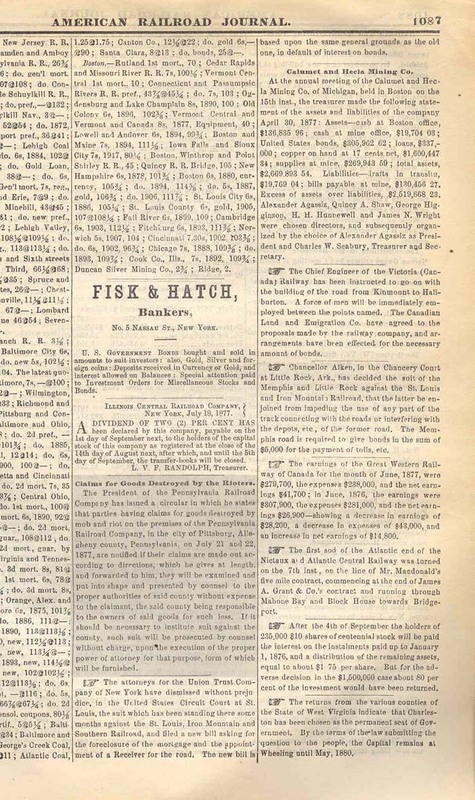 The B&O Railroad was one of the last roads to cut the wages of its workers, but at the same time approved a dividend increase for the stockholders. The strike started just a few days later on the B&O Railroad in Martinsburg, West Virginia. 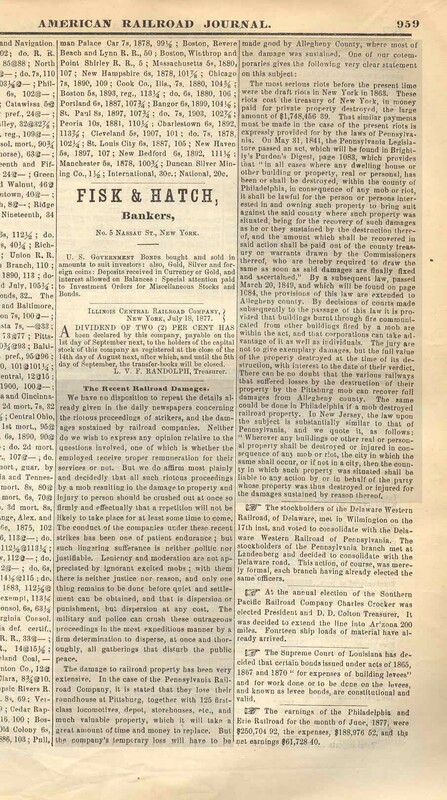 NOTES: An account published in the American Railroad Journal, the primary source of railroad news during the time, detailing the lawlessness that is taking place during the strike. 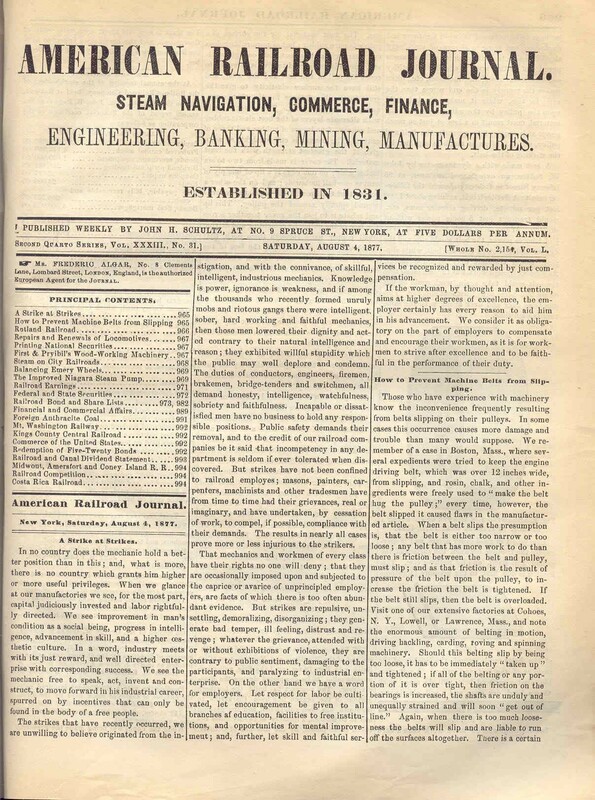 At the time of printing the strike was still taking place at many places throughout the country It can clearly be seen that the editors of the journal did not sympathize with the striking workers. NOTES: Editorial published by the American Railroad Journal saying that while workers do have a right to earn a fair wage, they do not have a right to strike in such a manner that it causes harm to the property of the company. The article also says that the actions of the workers "prove more or less injurious to the strikers." NOTES: The Pennsylvania Railroad, the road that sustained the greatest amounts of damage during the strike, issued a statement to anyone who might have had property destroyed by the rioters while it was being transported by them. The railroad decided that it was the fault of the local county, and their failure to protect private property and enforce the peace, that made them responsible for all damages causes as opposed to the railroad itself. NOTES: An attack on the Maryland Sixth Regiment by rioters, sympathizers, and hooligans as they marched to Camden station from the armory in Baltimore. 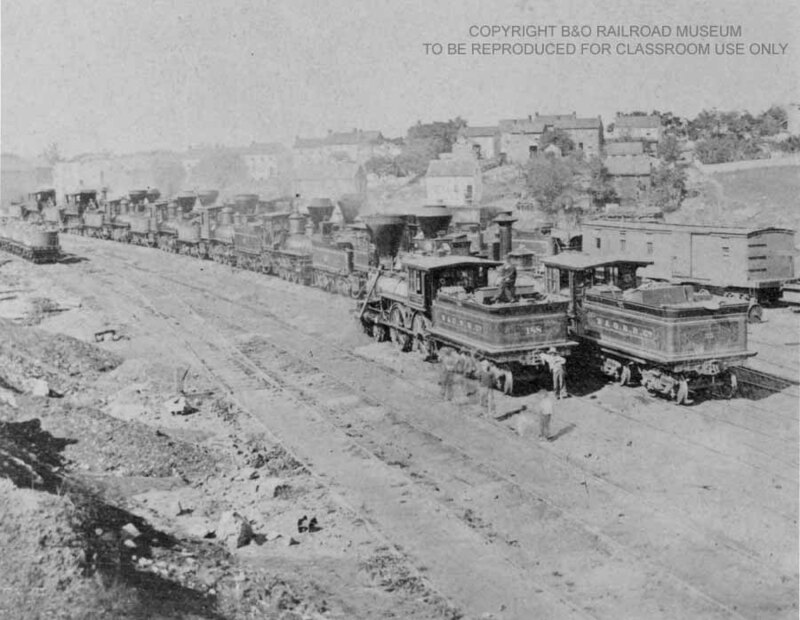 NOTES: Locomotives lined up as workers refuse to work during the Strike of 1877. The location is possibly Martinsburg, West Virginia. Bruce. Robert V. 1877: Year of Violence. Chicago: Quadrangle Books, 1970. Hofstadter, Richard. Social Darwinism in American Thought, 1860-1915. Boston: Beacon Press, 1955 (originally published 1944). Miller, George H. Railroads and the Granger Laws. Madison: University of Wisconsin Press, 1971. O. Stowell, David. Streets, Railroads, and the Great Strike of 1877. Chicago and London: University of Chicago Press, 1999. Access to materials linked within these document packets is intended for educational and research purposes. The written permission of the copyright owners and/or holders of other rights (such as publicity and privacy rights) is required for distribution, reproduction, or other use beyond that allowed by fair use or other statutory exemptions. The responsibility for making an independent legal assessment and independently securing any necessary rights rests with persons desiring to use particular items in the context of the intended use. The use of any user name and password to access materials on this web site constitutes an agreement by the user to abide by any and all copyright restrictions and is an acknowledgement that these materials will be used for personal and educational use only. In most instances, the username aaco and password aaco# will work. Contact ref@mdsa.net if you have any questions or have difficulty accessing files. Teaching American History in Maryland is a collaborative partnership of the Maryland State Archives and the Center for History Education (CHE), University of Maryland Baltimore County (UMBC), and the following sponsoring school systems: Anne Arundel County Public Schools, Baltimore City Public School System, Baltimore County Public Schools, and Howard County Public Schools. Other program partners include the Martha Ross Center for Oral History, Maryland Historical Society, State Library Resource Center/Enoch Pratt Free Library, with assistance from the National Archives and Records Administration and the Library of Congress. The program is funded through grants from the U.S. Department of Education. This document packet was researched and developed by Richard Olson.